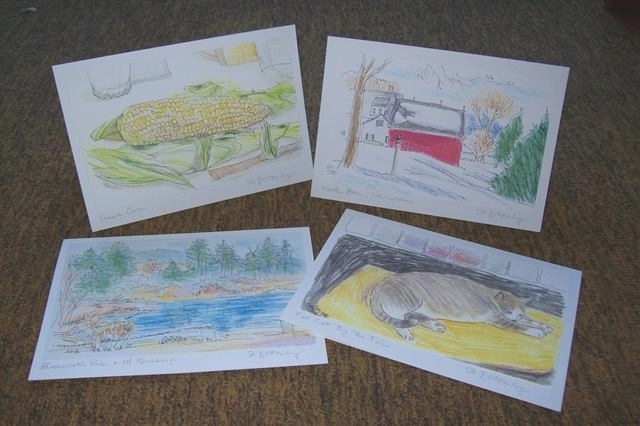 We had just arrived in Manchester, England, to participate in the seventh annual international symposium sponsored by Urban Sketchers. There were over 500 artists there, from 44 countries. On our first look out our hotel window, we saw this view of the magnificent Palace Hotel across the street. I like to draw complex edifices, even though it is impossible to get them right. So I get to just play with shapes and colors. Upon looking at other artists’ blogs from the event, we found that a number of them had had this same hotel window experience, and had also recorded this view as their initial impression of Manchester. 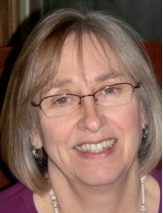 We are both keen followers of the history of nearby Manchester, New Hampshire, named in homage to the original Manchester. One feature of the symposium was a set of loosely organized sketch crawls to locations in Manchester. Its architecture and prosperous splendor bear witness to its role as capital of the Industrial Revolution. 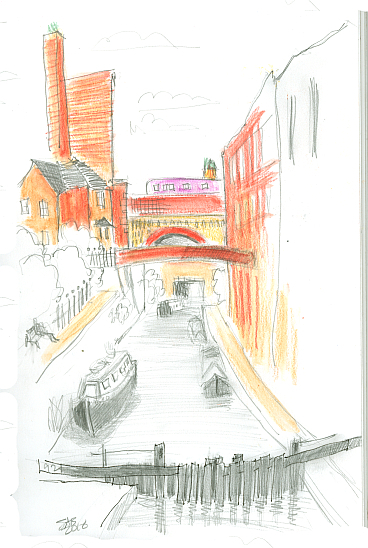 Here I stood on a bridge, leaned on the stone railing, and sketched the canal in the Castlefield section of the city. It connected Manchester to the sea and made it a port city. It was a complex scene, what with water, boats, a lock, various overpasses, a canal tunnel, and a purple train zipping by on a bridge. 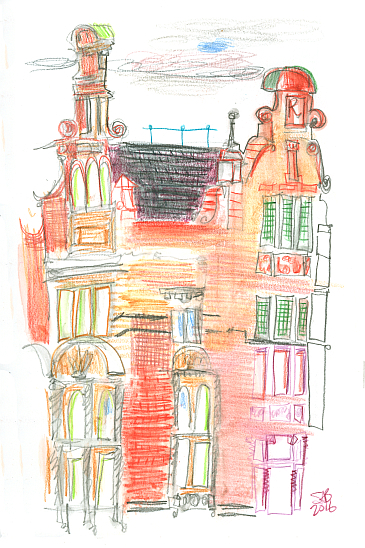 The city is filled with impressive and ornate Victorian brick buildings, and loads of new ultra modern stuff too. Not shown in my drawing are all the other sketchers, lined up along the walk and capturing their own impressions of the scene. This Manchester pub, Peveril of the Peak, is from the 1820 era, but was later clad in colorful tiles in Victorian times. I just LOVED the color shift from mint green to pea green. The back area interested me too, with the small garden and utilitarian courtyard. 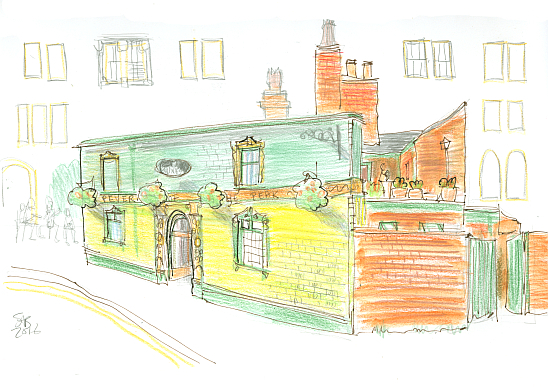 Sketchers can be seen at the left, capturing the impressive side door to the establishment. I had to look it up: the name of the pub refers to a novel by Sir Walter Scott. After we left Manchester, we traveled south to the Cotswolds, a scenic region about 90 miles west of London. 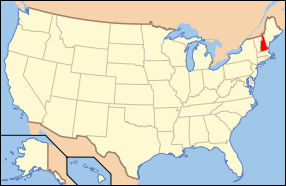 As a family, we lived in the area from 1980–83. 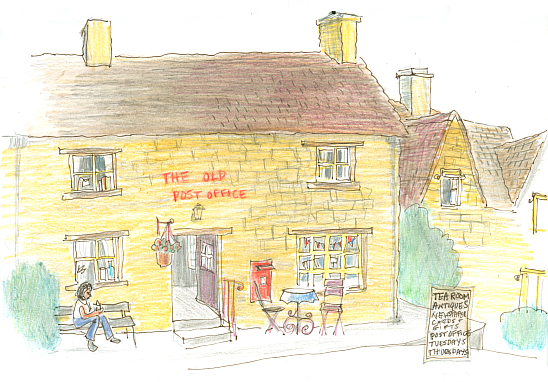 While we had lived on the edge of a large city, this time we booked a room in nearby Guiting Power, a village of about 500. The buildings are almost all constructed of yellow limestone, generally called Cotswold stone. 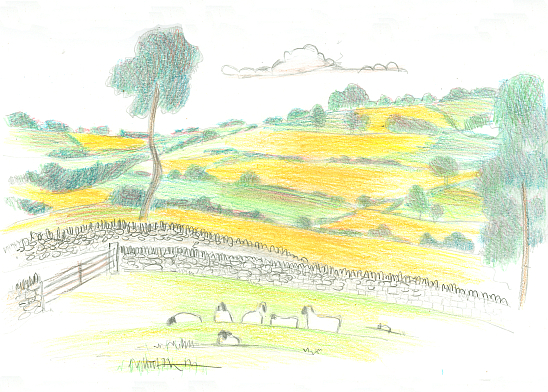 I sat on the damp grass on the small village green to sketch this. The Cotswolds attracts a lot of tourists in some of the larger villages. But here we were with nothing but hills of wheat and fields of sheep. The one in the front kept his eye on me the entire time. I thought he would come over to greet me close up. FYI, the stone walls are built with stones standing vertically along the top. It discourages climbing. And possibly jumping over by the sheep. 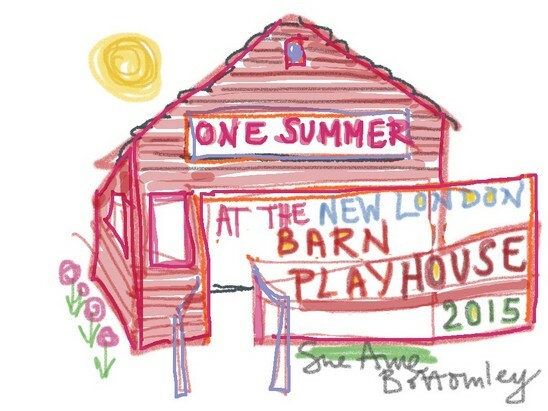 One day we drove to the village of Broadway. 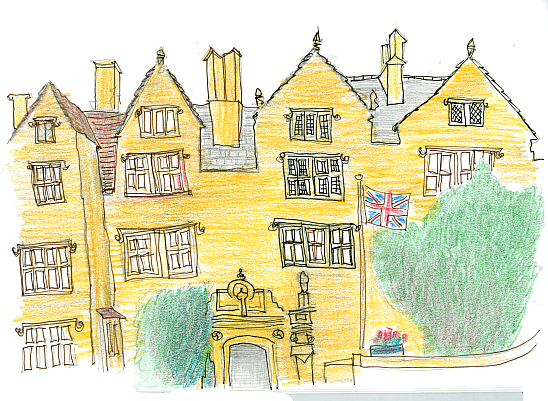 I drew this after a delightful lunch inside this imposing structure, the Lygon Arms Hotel, circa 1532. Most buildings of Cotswold stone are not this large. but rather cottages. I was told that it is a strong stone that hardens as it is exposed to air. Just a few miles to the west of the Cotswolds, the land and the looks both change. The land flattens as it nears the long Severn River. And the use of yellow limestone stops and is replaced with brick and the Tudor era black and whites. 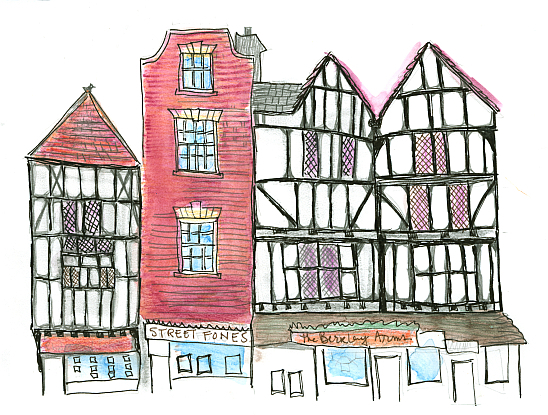 This row is in Tewkesbury, very near the abbey. Back in North America we are. 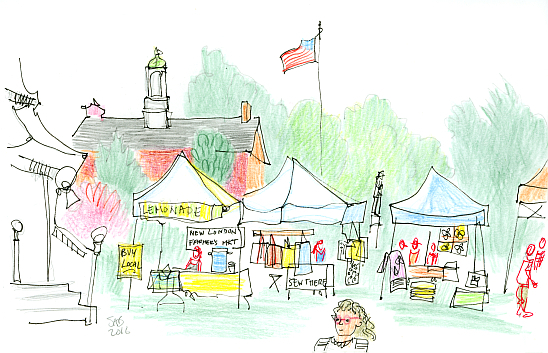 I drew this at the town market in New London, because business was slow. Have the tourists gone home? I couldn’t resist drawing a young girl with pink eyeglasses. Behind the tents is our town hall and also a monument to the soldiers of the Civil War. A stone sculpture of a soldier, on a pedestal. 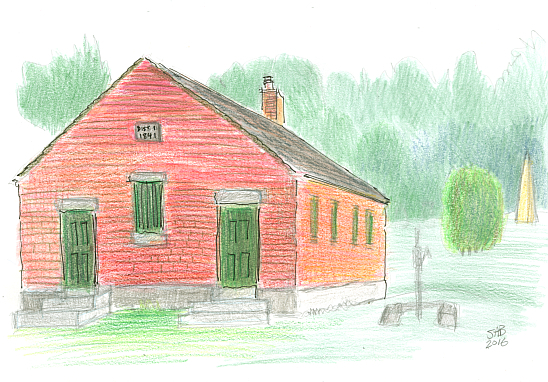 A new friend took us to see a couple of one room schoolhouses. This one, just over the state line in Dunstable, Massachusetts, is sheathed with wooden clapboards painted reddish brown. Sometimes called barn red. 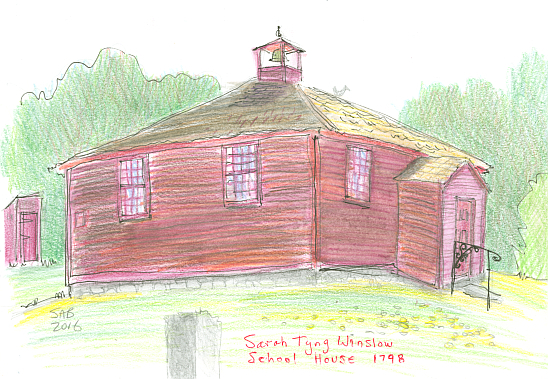 The next schoolhouse, just north in Nashua, New Hampshire, is quite different architecturally. A nice red brick construction with green wooden doors. Massive slabs of granite form the structure of the windows, the foundation, and the steps. The small nameplate says Dist No.1, 1841. 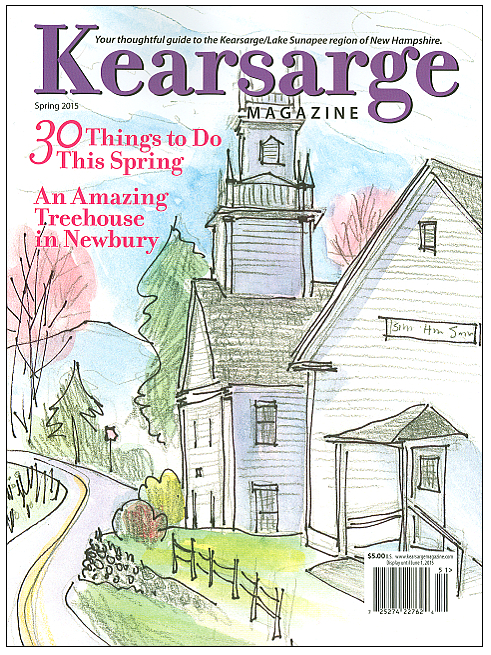 Our friend has been instrumental in the preservation and upkeep of this building. 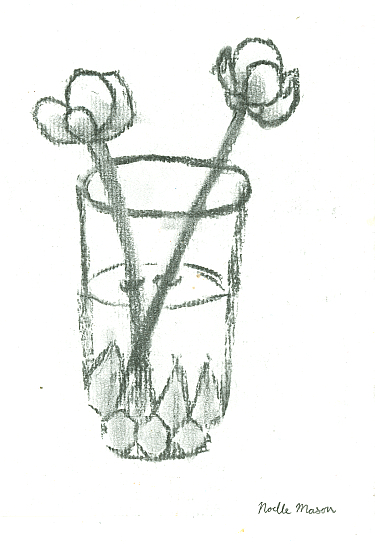 And to finish, a sweet charcoal drawing of budding waterlilies in a kitchen glass by our 13 year old granddaughter.